Baton Rouge Parish Family Court, Division B, in 2008. Louisiana Department of Social Services in 2004, where she led legislation and supervised the bureaus of General Counsel, Appeals, and Civil Rights until 2008. She also served as statewide director of the Louisiana Child Support Program from 2001-2004.
the State of Louisiana, she served as chair of the Child Support Committee of the Louisiana State Law Institute from 2004 to 2010; and chair of the Louisiana Child Support Guidelines Review Committee in 1999 and 2004. Judge Woodruff-White currently serves on the Executive Committee of the Louisiana District Judges Association, where she serves on the legislative committee and chairs the self-represented litigant committee. 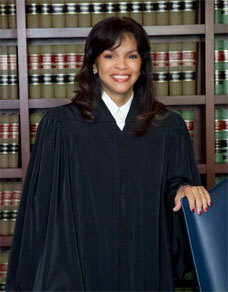 She also leads legislation in the area of family law for the Louisiana Council of Juvenile and Family Court Judges. In furtherance of her passion for ensuing access to the courts to all citizens, she serves on the LA Supreme Court’s Self-Represented Litigant’s Committee and the pro bono services committees of the Louisiana State and Baton Rouge Bar Associations. She is also a former commissioner on the Louisiana Housing Finance Agency (LHFA) Board of Directors, former vice president of the National Child Support Enforcement Association, former executive board member of the National Council of Child Support, and former president of the Southwest Regional Child Support Association. ← Judge Lee V. Faulkner, Jr.